It is a Monday morning and I’m doing my blog. On Friday morning I had cedar wood dropped. This weekend I spent the three days helping trim out the office. The windows, corners and such to keep birds, insects and such out of the domain. We saw rain, hail, snow and sunshine throughout the weekend. Yes. This is Michigan. We won our soccer match yesterday which was hard-fought and again – cold. I’m playing catch up on this blog so I can attend a meeting this morning. The “40 Nights” experience is rolling strong. Below is an interview I did for a UK blogger. Also Weds is our release date for our soundtrack by Dennis Therrian. “Bestseller” is now rolling out to rental and retail stores nationally. You can buy here. “Ashes of Eden” for sale! I ask you to consider adding these four films to your collection. Last week we did some additional wrap up on “Chasing the Star” which is in editing. We should be close to a rough cut by month’s end. I’ve also been focusing on my script writing. I’m planning to sell off some of the screenplays I’ve written that I don’t plan to produce. I’m waiting to see if a sale goes through in June. If you’re looking to purchase a screenplay in a certain genre reach out to me. More meetings including the one I have to get around for. Have a great week and work hard. Good things happen when one works hard. Today we are doing final prep on “Chasing the Star” the second film in our QUEST TRILOGY. I’m happy to announce that these three gentlemen are the actors we landed on after looking at reads from around the United States. These three are representing the Texas, South Carolina and NYC (By way of Michigan) markets. If you work hard you can make it happen from anywhere. It’s been fun to see all the artist come together – every day new props, new wardrobe tests, new gear arriving and new family. Yes. The film family is a unique experience and as a producer I’ve always strived to create an experience that people will remember. I think we’ve been doing that at Collective Development Inc. for some time. Even those early films like “From Venus” and “Heaven’s Neighbors” were filmed with great care creating lasting memories for all. While this new film is launching we’ve been heavily promoting and pushing our other films to market. We’ll be doing our Yuma, AZ “thank you” premiere of “40 Nights” on March 13th, hosted by Champion Church. They helped us with everything from background talent to use of locations. The Lansing/Grand Rapids theatrical run of “40 Nights” has just expired. We’ve been approached by many interested people who wanted to see the film on the big screen, so, we may move the film to the Sun Theater in Grand Ledge or other such venue to keep that momentum. Many are asking us to bring it into Detroit via one of the chains there. We will try. Here in AZ we’re looking at a meeting with Harkins Theaters to do a run, so we’ll see if that comes together. 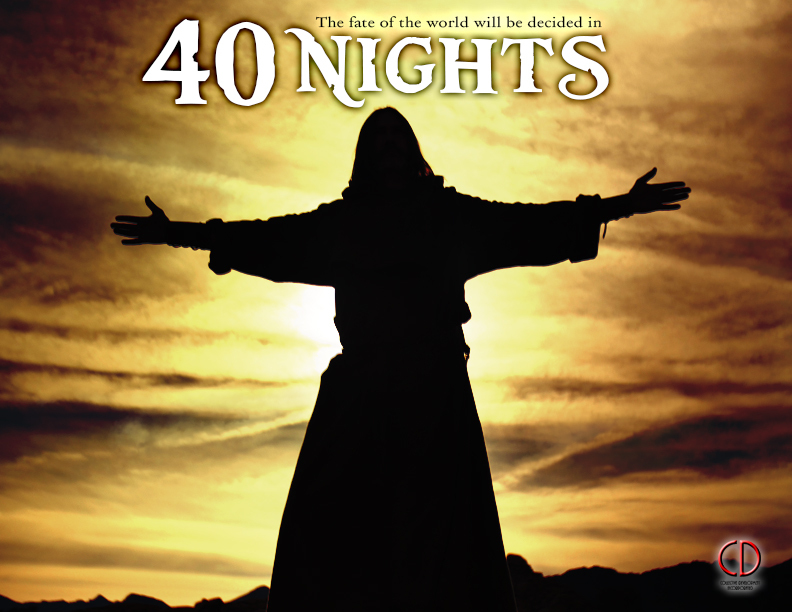 April 5th is the “40 Nights” DVD release at most major retailers. The streaming release looks like it will happen in June – more on that soon! You can pre-order the film DVD at several retailers but here is just one. We also just released distributor poster art for “BESTSELLER,” which releases in May. This film is a great curl up and watch thriller. Be afraid! “Ashes of Eden” is another film of ours that releases on April 5th – great story, music and performances. Keep clawing your way towards your dreams! Happy Saturday everyone. The sun is out but the freeze it still in full force here in the Michigan. As many of you now know we announced the next film “40 Nights” shooting next month. For fans of the biblical/drama films like “Book of Ruth,” ‘Ashes of Eden,” or “Wicked Spring” you will enjoy this news. If more intense films are your cup of tea you will have “Bestseller,” “The Terrorist,” and “Dead Quiet” coming at you later this year. I’m excited about “40 Nights” because it takes a very simplistic look at a very complex character. I can say that I don’t think any other film has approached this story in this way. Behind the scenes we’ve had a lot of excitement and interest. So we’ve been making strides in development for a while now and finally everything has lined up. So next month we are going out west to tell this story. We are taking some of our keys but unfortunately can’t take the entire army. We will be joining with artists out there. Several artists that I’ve worked with previously on projects. The issue is that only so many cast and crew and I’ve worked with a lot of talented people. If I’ve worked with you before and had a positive experience you are always considered. Sometimes with talent I’ve submitted you to our director and you don’t even know it. Often when you get a call from out of the blue offering a role that is exactly what happened. I also sometimes feel at blame if people don’t get a role but truth is that either the role didn’t fit or the creative director had a different idea. But that said, I do love all my co-stars and always put you forward when I see a right role. We are mostly cast save a few smaller roles and one of those is a child actor. If you like these kind of films the good news is that we have been approached about doing several. So we will focus on this story for now but in the future many more of my friends and associates could be getting calls. “BESTSELLER” is sounding great as we get ready to start the score with the amazingly talented Dennis Therrian. We just had our Director of Photography in town and had a great color correction discussion to get things rolling. We saw almost all the FX work placed into the film and I can say great work by DNA Design. This film is being slated for 1st showings in May around author Christopher Knight’s stomping grounds. From there it will start playing various locations theatrically. This coming week will be FULL of final off-location prep work and packing to leave for our home away from home. Our destination has been between 72-83 degrees so that will be a nice change. On-going sales discussions on the CDI library are continuing and possible projects are lining up. I may take on a script writing assignment when I return. I’m finishing a few personal scripts as we speak. We also have a commercial project that is in the works to do this spring. Aside from all the work I’m ready to pour my everything into this next role and after that…outdoor SOCCER SEASON! JUNE 1st! I woke up this morning and got the fresh pot of coffee going. I did the 1st of 3 interviews for the upcoming release of “Darkest Night”. I’m excited that this story is going to finally release here in the US/Canada. I won’t go on and on about this film as you will soon have many interviews to read and also the film itself. The end of the week has been rain, rain, rain which is great for the new plants in the garden. Let’s get right to some FILM NEWS! ASHES OF EDEN rough cut is done and we are doing a producers watch on Tuesday to make final notes before Shane Hagedorn makes his final passes on the film’s edit. I’ve seen the scenes individually and I’m beyond excited. The scenes are POWERFUL and I’m so proud of all the artists involved. DONORS is almost done with the music and so that film is closer to being ready for release! CDI Distribution team is closing in on several deals for films in the CDI library. It looks like “Darkest Night,” “7 Stones,” “Locked in a Room,” and “Wicked Spring” are heading to Germany. We will be working to finalize that deal this month! Stay tuned for other territories! “Wicked Spring” and “Figure in the Forest” should be releasing this month on Parables Network my contact is saying. “Supermodel Showdown” TV series is also looking great. I think it gives a fun, honest look at what goes into a REAL reality show. This week was great on the development front. I read a few scripts as an actor and I should be making some decisions on summer filming here soon. The picture is getting more clear as I go. On that note – David Gries is working into the tribe here at CDI. I’ve explored his on-camera work this year and we’ve been working on a few projects together. I’m most appreciative for his opinions and work in helping me put together a 3 min sizzle reel that I wanted for a few opportunities. I sent the reel along to a few professionals yesterday and I will share it first on here. Enjoy. This is what actors use to showcase themselves and their diversity. It gets so hard because you end up with so much material. What stays? What goes? So I want to thank David for his help with this. Maybe this will also inspire you to watch a few of the films showcased. Anyway this is my Birthday month and I’m kicking it off with the new reel. This month will bring great growth and I will continue to move forward on this journey step-by-step. I encourage you to do the same. Don’t look at how far you have to go and let doubt sink in. Just take that step. Take that next step. Soon you will realize how far you have actually gone. Life is a journey and not a destination so enjoy it. You can’t enjoy a breakthrough without setbacks. You can’t have satisfaction without some frustration. You just want to try to keep your balance and tackle each issue as they come. From the struggle always comes growth.